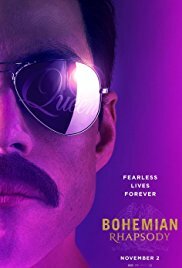 Serving as a chronicle of the years leading up to the rock band Queen’s legendary appearance at Live Aid in 1985, this is the story of Freddy Mercury (Rami Malek), Brian May (Gwilym Lee), Roger Taylor (Ben Hardy), and John Deacon (Joseph Mazzello) Written by Anthony McCarten and Peter Morgan with Directing credits to Bryan Singer this love letter to Queen is a canted angle of observation leaving audiences with a downright stellar performance from Malek, but ultimately a rather hollow story of the band’s up’s and down’s in sickeningly sweet reflection to the mantra of “we’re family” and attitude of us against the world, often settling band disputes with their next big hit in a dance off style fashion. But, looking past the syrup and schmaltz, this two hour and 14 minute walk down Queen’s memory lane and greatest hits offers up a handful of anecdotal moments and interesting tid bits behind the scenes, plus deeper insight to the love life of Mercury leading up to his death in 1991. Worthy of a matinee for the spectacle factor, you’ll clearly have plenty of hit tunes to be humming on your way out of the theatre. Bohemian Rhapsody is rated PG-13.